Friday 2nd June 2017 - Mostly fine with some sunshine but quite blustery! This morning we left Strandhill in County Mayo behind - but not before we'd nipped into their Lidl to do our essential weekly restock - so by the time we actually got underway properly it was nearing mid-day. Our target for today was Achill Island, Ireland's largest island and one that is joined to the mainland by a bridge. However, by making that our next stopping place we were missing quite a bit of the Erris corner of Mayo out, but this was because even though we're on an extended tour we really haven't got time to see and do everything, and also we felt it was a bit risky to take our large T4rdis2 down some of the little roads that hug the coast in that area. Therefore, we did the sensible thing and stuck to the main R roads which took us across spectacular open moor land where huge swathes of rhododendrons bloomed in amazing gay abundance, and we were also provided with frequent coastal views which, amongst other things provided a fantastic glimpse of Dun Briste (The Broken Fort) - a sea stack which lies just off the tip of Downpatrick Headland. And really, on our journey we only came across one problem - and that was finding a stopping place for lunch! John had been very organised and marked somewhere that he thought would be suitable on the map - but it wasn't! Oh well, we said 'there's bound to be somewhere just up the road', but there wasn't, and by the time 3pm came along we were starving! So when John spotted a tiny picnic site that we'd just sailed by he very quickly put us in reverse and landed so he could be fed! After that it didn't really take us much longer to reach our 'Aire' like campsite - Safe Night Ireland at the Hy Breasal B&B - which is situated just after we'd crossed over The Achill Sound bridge. There we were met by the very friendly owner who provided maps of the cycling routes that more or less cover the whole of Achill - so that would easily provide for one day's entertainment. 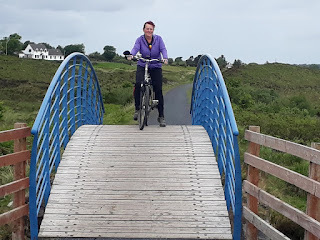 Then our plan is to spend another day exploring The Great Western Greenway which is the longest off road walking and cycling trail in Ireland - but that may depend on how the weather treats us! Saturday 3rd June 2017 - A very windy day but with some sunshine and only a bit of rain. There are 3 signposted cycle loops on Achill - Loop 1 is 44kms, loop 2 is 28kms and loop 3 is 12kms, but rather than sticking to any one of them, we incorporated all 3 into one ride and with doing our own thing we ended up cycling 65 kms (40 miles), but we did see most of the island! We left the site and toddled along Achill sound where we found pretty views over the water, and also Kildownet Castle who's history tells of a Sea Queen called Grace O'Malley. Apparently her family were seafaring chieftains in South West Mayo and they built the castle with money made from piracy and taxing boats sailing through their waters. Then soon after that we rounded the bottom point of the island and from there our ride became wild, windy and stunningly beautiful with the rugged mountains rising directly out of the sea, and massive waves crashing into the rocks throwing huge plumes of spray high into the air. The almost traffic free lane led us up high onto the cliff tops where we paused at a view point, and we did consider having a break - but we abandoned the idea because the waves that would almost certainly have formed on our coffee might have made it difficult for it to stay in the cups! However, while we were there we learnt about creating heat the hard way! There was an info board that explained how islanders still cut turf from peat for fuel. Traditionally almost every farmer had his own turf bank and he would commit a week's back braking work in spring to provide his family with enough fuel for the rest of the year! It went on to say that champion turf cutters could work so quickly that they could keep six sods in the air at once! Anyway, we didn't linger to long there and we soon found ourselves zooming down the other side of the cliff to the tiny hamlet of Dooega where coffee and scones were consumed before continuing on a further 15 kms to the seaside town of Keel. But to get there it was a battle and a half because we were riding straight into the very strongly gusting head wind, and even though we'd read in our guidebook how Keel takes the full force of the Atlantic along it's 3kms white sand beach, we weren't quite prepared for the real thing! But having said that the fantastic views, along with lunch made the battle well worth while! From Keel we needed to head towards the opposite side of the island, and in so doing we passed by The Deserted Village at Slievemore where there are ruins of more than 80 houses, and also The Colony which was a mission settlement founded by Edward Nangle. Mr Nangle visited Achill in 1831 and he was so moved by the poverty of the people there that three years later he opened Achill Mission near the village of Dugort. He built schools, an orphanage and a hospital, and at the height of the Great Famine, the Colony employed over 2000 labourers and fed 600 children a day. And it was while we were learning about all that that the rain moved in - huge heavy hard hitting spots - so the only thing for us to do was to switch Turbo Power on and try and outrun it! And to some extent we were successful - we were only a bit damp around the edges by the time we got home - but maybe we were spurred to even greater speed when a vicious little dog gave chase - luckily he couldn't quite keep up! Sunday 4th June 2017 - Cloudy with a few good sunny spells and a couple of heavy downpours! As planned today we set about riding along the Great Western Greenway, but even before we left T4rdis2 we'd decided we weren't going to do all 42 kms of it (84 there and back) - we were just going to go as far as Newport which resulted in a ride of 42 miles, which after yesterday, was quite far enough. The route follows that of the old Westport to Achill railway which was built in 1896 and closed in 1937. It was converted for it's present day use in 2011, but really along the way there are very few reminders of it's former life, however the sign boards informed us that the way would offer gentle gradients and some of the most idyllic scenery in this part of Ireland. The latter was certainly true - we enjoyed fantastic coastal vistas, and also huge areas of flower bedecked countryside with distant views of hills and mountains rearing up before us - and this included Ireland's holy mountain - Croagh Patrick, a place that is likely to be on tomorrow's agenda. But I'm not sure if I would have called all the gradients gentle - there was more than one that caught us unawares and tipped us off because we were in the wrong gear! We found these two along the way! but we couldn't quite decide which was who! Along our way we paused above the town Mulranny for a break, and then marvelled at the view of the many tiny islands in Clew Bay - apparently they are a legacy of the last Ice Age when the retreating glaciers left behind hundreds of low elongated hills known as drumlins! Then after about 22 miles we arrived in the town of Newport and sat by the tranquil Blackoak river for lunch while we watched fish flipping out of the water presumably to catch insects. But by the time we'd finished our meal the skies were darkening and we correctly guessed it would be unlikely we'd make it home without a dousing - and we didn't. In all we were riding for about 4 and a half hours, and even though we peddled as fast as we could on our return journey the rain caught us while we still had about 10 miles to go. However, at that stage it was mostly gentle rain, but later once we were back within the safe confines of T4rdis2 it absolutely hammered down and we felt quite sorry for the nearby soggy campers.